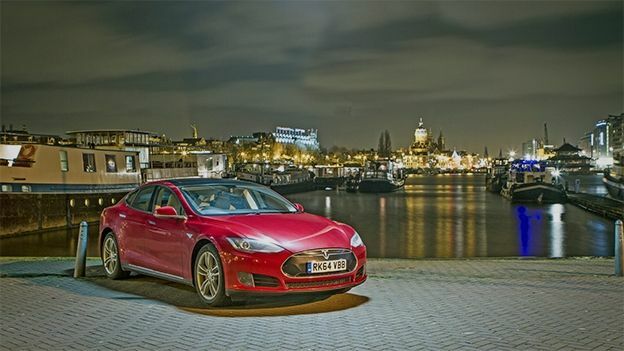 Everyone I spoke to in advance of embarking on the 600-mile round trip to Amsterdam's charming Volkshotel in a Model S electric vehicle supplied by Tesla scoffed rudely (well, they didn't. This is for effect, obviously) and confidently informed me I'd never make it. Have you got the AA on speed dial? They quipped. Make sure there's a tow bar! They grinned. Etc. Chortle, chortle. My better half even ran a Facebook thread updating my progress for concerned friends and relatives. So it seems EV makers, and Tesla especially, have a PR mountain to climb in winning the hearts and minds of customers and convincing them that EVs aren't vanity purchases that won't work in the real world. They're the Apple of car manufacturers, right? Niche and expensive, and their plugs aren't even industry standard. Well, no, actually. Yes, the Tesla Model S is an expensive vehicle. Prices start at £49,380 for the 60kWh battery version and £56,780 for the longer ranged 80kWh variant, going up and up and up depending on which option boxes you tick, they won't be replacing Ford Mondeos, but rather BMWs, Audis and Mercedes. That's alright. BMW are obsessed with performance, Audis with auto piloting and Mercedes heads up displays, mostly. But after that, it's all gravy. They're road tax exempt, congestion charge exempt and qualify for a company car tax rebate. They give out zero emissions and the government even dish out a £5,000 grant to ease you into your early adopter pain. The thing is, and before we get to the road trip, it's worth pointing out that you'll probably rarely, or never use the supercharger stations we were going to rely on. The government wants you to own an EV. So much so that they're currently subsidising installation of home charging points, so you can pay a subsidised £95 charge towards getting a 240V wall charger installed at home which charges at twice the rate of a standard wall socket at 58 miles of range per hour charge. You can even schedule charging via Tesla's companion app (this also tells you current charge state, where the car is in the world, currently, and remotely unlocks the car and puts the heating/AC on). Tesla recommend that for battery longevity, you top up your charge to 80% daily. This costs between £8 and £10 for a full charge, depending on your energy provider. Ask your dad when the last time you could fill a car for £8 was? He probably still had luxurious hair and strong erections. Any roadside charger made after 2009 will be compatible with Tesla's plugs and the car comes complete with adaptors for older units, so if your Model S was sat in your garage overnight inexplicably not being charged up, and you've somehow, forgetfully managed to use up the 200-odd miles in the “tank”, you can charge up via a publically available street charger stand. But feel so foolish that you'll never do it again. And a new Tesla comes with an 8-year infinite mile battery and drive unit warranty, so it's the very opposite of your iPhone, whose battery feels like it needs a swap after about six months of furious Whatsapping. Is this a good time to point out that Tesla has committed to keeping superchargers free, in perpetuity? So while you'd spend 5 minutes sticking probably a spit off £100 filling up your gas guzzling comparable Merc or Beemer to get to Amsterdam, your Tesla owning chum will be having a 20 minute coffee break, filling up 150 miles of range for zero pence, Euros or dollars. And the superchargers are impressive. Using Tesla's proprietary technology, they shovel up to 120 kW of direct current (DC) power directly to the battery, Model Ss are the only cars which can currently take that load. And it's strangely compelling thing, sitting in the driver's seat, watching the range tick back at a rate of knots. Worldwide there are currently 358 supercharger stations with 1,956 superchargers. 126 stations with 660 superchargers in Europe and 20 stations with over 50 superchargers in the UK. So all this saw us powering up the motorway in a £65k car, basically trying to get it to run out of juice. Fat chance. Tesla's quoted range of 265 miles on a full charge is pie in the sky, and if you check the small print, that's at a constant, Gran-piloted 55mph. In the real world it's nearer 200 miles, because we like to overtake things and drive at inappropriate speeds. This is, of course, the same as a petrol car, the fuel range drops like a stone the second you start driving like a berk, so it's to be expected. Our 600-odd mile journey, then, was easily planned via the satnav: there's a search option for superchargers only, so we hopscotched from one to the other, from Westfield, London to Maidstone Kent (42 miles); Ghent, Belgium (123 miles) and Oosterhaus, Holland (78 miles) before a final, 58-mile dash to Amsterdam. At each stop we tarried between 20 minutes and an hour and found the shortest stop averaged around 150 miles pumped back into the batteries to all but filling them over an hour. Only a silly, top speed dash to catch a Eurotunnel on our return on day two saw us ease into the Maidstone supercharger station with just 8 miles left in the “tank”, but who's not coasted to a petrol station with fingers crossed and the fuel light glaring – not angry, just disappointed? Let's talk about performance. It's crazy. The 85kWh we had packs a 380hp motor delivering 440Nm of torque, for a top speed of 125mph and a 0 to 60 of 5.4 seconds. But the difference is that the single speed automatic delivers all the torque all the time, so getting down the road can be spectacular. It just pushes and pushes. Make no mistake. This is a fun car. In conclusion, it's difficult to see a flaw in Paypal billionaire Elon Musk's Tesla plan. The Model S is fun to drive, supercar swift and exempt from all sorts of awful taxes. An overnight juice will fulfil 99% of anyone's driving requirements and there are superchargers for the more extreme demands. In fact, the only issue on their horizon is if sales do scale up. Having to wait for a supercharger station to become free before your 20-minute juice would get tired real quick. Yes, it's expensive, but after that, running costs are insanely cheap, and with a motor housing just 17 moving parts, reliability should be class-leading and maintenance dirt cheap. Time will tell on those things, but what we can confirm is that if it was a range worry on your list of reasons not to buy a Tesla, you can strike through that thing right now. And keep on saving.